(Phoenix, Arizona. June 13, 2011) – In the world of underground piping, a mechanical joint fitting has been the status quo for connecting two pipes for as long as anyone can remember. When laying water pipes, crews have historically had to stop and install a mechanical joint fitting to complete the connection, which takes additional time and labor. A cost-effective and easy alternative to this option is to use a push-on fitting, which results in a significant reduction of worker injuries. The Bevel-Sert, an HDPE edge that instantly creates a bevel to join two pipes, is a push-on fitting that nearly eliminates worker injuries and corrosion associated with electroconnectivity while extending pipe life up to 11 times. Currently, the accepted practice among underground construction teams is to use a cut-off saw to cut the pipe and then, with the same saw, grind a bevel onto the cut pipe to connect them. However, OSHA clearly prohibits this behavior due to the safety implications to workers using the tools incorrectly. Using a cut-off saw to bevel pipes has been the go-to solution for a number of years because of its speed and ease. The worker already has the saw in hand from cutting the pipe end, so turning it on its side to bevel is arguably the easiest option. The sideways blade grinds down the pipe to create the angled edge casinobonuses.io and then the male end of the pipe is forcibly pushed against the rubber gasket in the female end to create a seal. While this may seem a reasonable way to bevel pipes and keep production moving forward in a timely manner, it presents numerous hazards. Eye injuries are prevalent when cutting pipe, even if the worker is wearing personal protection equipment. Ductile iron pipe shrapnel consists of tiny flecks of ground material that can be caught in the eye area and even get rubbed into the eye itself after goggles are removed. The irritation causes increased tearing, and those salt-water tears oxidize the iron very quickly, causing it to rust to the surface of the eye. If you magnify that result with millions of gallons of water coursing through ductile iron pipes, you begin to see the larger issue of corrosion in our infrastructure. 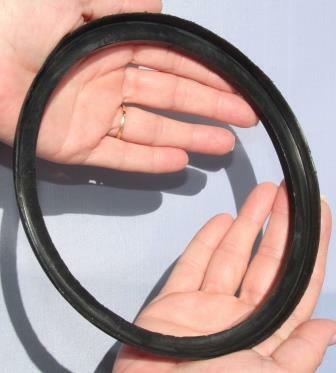 The Bevel-Sert is an HDPE beveled edge that connects two pipe ends. The product comes in a variety of sizes to suit your needs. It is manufactured by Infra-Tect, located in Tempe, Arizona. Infra-Tect is a water and wastewater underground infrastructure company that provides innovative solutions around pipe corrosion prevention, worker safety and productivity improvements that save you time and money. The Company has developed several patented products designed to ease the installation process and protect ductile iron pipe, C-900 PVC, IPS PVC, SDR-26 and SDR-35 PVC pipe or fittings. This entry was posted in Phoenix, Arizona on June 13, 2011 by admin1.